Is each recommended action (what to do) stated specifically and unambiguously? That is, would members of the intended audience execute each action in a consistent way? If not, rewrite the action. Under what conditions will be performed? Would the guideline's intended audience consistently determine whether each condition has been satisfied? If not, rewrite the condition. Is there Equilibrium or a preponderance of Benefits or Risks, Harms, and Costs? 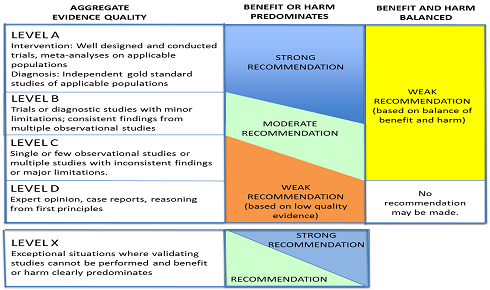 What aggregate evidence quality supports these benefits, risks, harms, and costs? A Intervention - well designed and conducted meta-analyses on applicable populations; Diagnosis - Indept gold standard studies of applicable pops.